Once you have built the stables in the Need for Steed Quest you can built and clear the first arena which is horse tricks (read my guide to the stables post for more information) Once built two adult sims and 2 horses can complete this hobby at one time. After the time has passed come back and click the exclamation mark above your sims head to find one of the ribbon collectibles. Every time your sim does the horse tricks your horse tricks hobby skill level up percentage will increase, once you reach 100% you will level up, there are 6 levels. You need to reach level 6 to be able to unlock all of the ribbon collectibles, once unlocked you will be able to find them. Horse Whisperer Say Hi and Shake your Head are now unlocked in the hobby collection. NOTE: only the first sim completing this hobby needs to get to level 6 to unlock all the collectibles, future sims will be able to find any collectible even if they are only on level 1 in this hobby! You will now also be able to use the 2 star horses to complete this hobby quicker! This hobby was disappointing. After three hours, there were several times when the exclamation point never appeared and my Sim just stopped. It happened about 20-25% of the time and was still happening months after the hobby was released. I completed it once, but won’t again, and I don’t want to waste even more time vaulting. If they ever fix the glitch, I wish that preteens and teens could do this hobby. Also, I think that they should keep their riding outfit on and not change back into their regular clothes while doing it. help needed. I’ve cleared out the Horse Vault area and was ready for my sim to practice, etc… But I need a 2 star horse. My question. I know I can buy a new horse, but if I don’t want to, yet, will my 1 star (that I got free) ever earn a 2nd through other actions? And going forward with anything else (well, except furniture) increase in star ratings based on use? Have you fixed the ground and the gate? I have the same problem. All cleared. Did it once and now blue footprints just appear every time for no reason. This is strange, Have you tried with another sim? 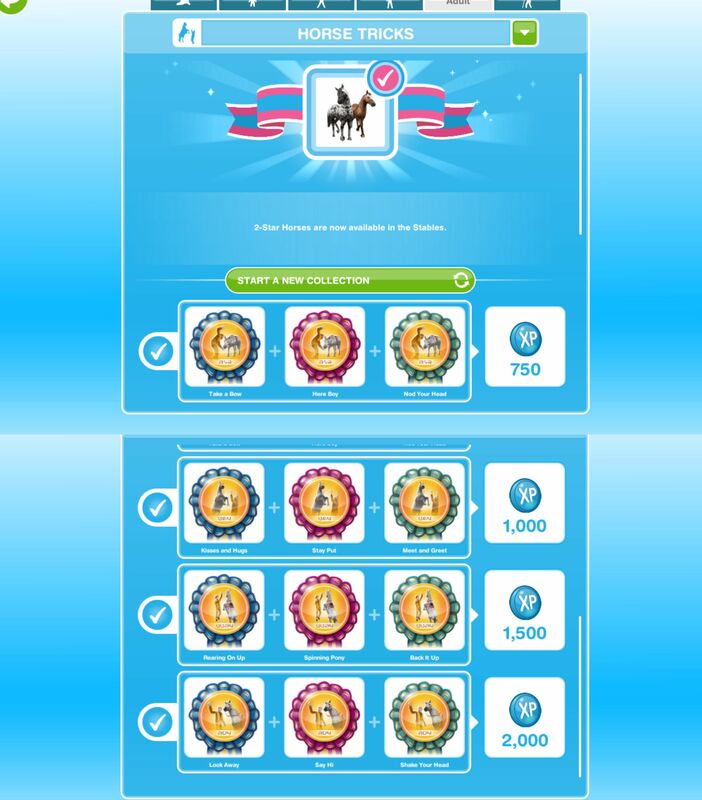 I already completed this quest and hidden unicorn quest, unlock all stables, reached level 6 horse tricks skill, and completed the collection then begin the next collection. But, why i still can’t buy the 2 & 3 star horses? I’m not sure, sorry! Have you tried with another sim? It’s because your sims can’t access the arena another horse is probably in front of gates . You have to click on ride the horse and make your sim ride the horse to different spot (away from gates) than dismount horse and pick the horse you want to use to vault / tricks/showjump etc and the gates are now clear to enter . I have a question for anyone who knows my sims life dream is to enter horse shows… How do I enter a horse show? Wow, thank you so much. If anyone else is having trouble, click ride the horse, take it out of the gates, then click tricks and the horse goes back to the arena where he needs to be. It worked! How do you put the horses back in their stable ? Can neighbours help clear the horse tricks area? I’ve been attempting to do the horse tricks for weeks. I’ve clicked the action and my sims (2 different ones) have done it, but I’ve yet to receive any ribbons. I’ve done this maybe 10 times and because of this I was unable to work towards getting the unicorn. Its aggravating. Has this happened to anyone else? I can’t proceed with the hobby if I’m not being rewarded for what I’ve done. are you sure it isn’t just wandering around the outside area of the stables? All I need is the final lvl 6 ribbon it all the game gives me is “take A bow”. I’ve been trying for two weeks straight. Anyone else have this happen? Can a two star horse do horse tricks and show jumping? Also, can the horses bought with lps do different things than ones bought with simolions? Ps love your blog;). I kept getting the blue tracks earlier today. I had my sim ride the horse out of the horse trick pen. Then I clicked the horse and the option for the horse tricks and both the sim and the horse went to the pen and did it. Yay! I have one sim who is level 6 on this hobby, and I have some advice. I want to unlock the two-star horses for another sim to own, and so I had to do this hobby. I have been constantly having Temporary Sim (the name of the horse tricks sim) do the horse tricks hobby. I started the hobby two weeks ago, and last week she became level 6 and so far has one last medal to go! In the morning (8 o clock) , if I am able to check up on my sims before school, I collect the medal she got and start her on another round. After school (4 o clock) I check up on my sims and collect her medal and start her again. Then after I’m done with my homework and all that, I go to the game again (7 o clock) and after I check on my other sims, I go to the island to collect the medal and start her AGAIN! I think this way is efficient because you have a greater chance of getting all the medals quickly. Tips: Don’t get frustrated. I know it’s annoying when you keep getting beginner medals, but all you can do is keep on going. Downside: Since she is only doing the hobby and nothing else, she is stinky, tired, and needs to use the bathroom. But hey- she isn’t confined to her house yet! Besides, when I updated, she became inspired again after a long time. How many sims can do the Horse Tricks Hobby at a time? I noticed on your horse vaulting and show jumping posts that only one sim can complete those hobbies at a time. Are the two-star horses free? No, none of the horses are free. A few people have had this issue recently, you will need to contact EA about this issue to see if they can fix this for you as I am unable to fix technical issues. I come to your posts everytime I need advice you are the best! Now I have a question that I see hasn’t been asked yet. I have completed all the horse challenges, do I need to keep a sim at that hobby? Like is there a time quest for it that will pop up later? Ex fashion designer or wood bench are used often in time quests. Will this happen with show jumping or vaulting or even the kitten and puppy hobbies? I try to leave at least 1 sim on each hobby but I am running out of Sims and am almost at vip 6 to have another sim added but I can use those who are in horse and kitten hobbies instead of just having them sit.